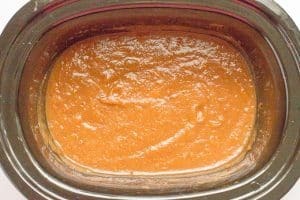 An easy slow cooker apple butter no sugar added recipe that doesn’t require any peeling and doesn’t use any added sweeteners or juice! I’m actually pretty OK that it’s Monday this week. The weekend felt gloriously long. We had a fall festival at M’s school on Friday night and it was fun to see her run around with her new kindergarten friends. We had lots of rain from the hurricane on Saturday but ran some errands, made some crafts, played some music and ended with a movie night for the kids (a rare treat). Yesterday we soaked in the glorious sunshine and got lots of fresh, fall air playing outside. 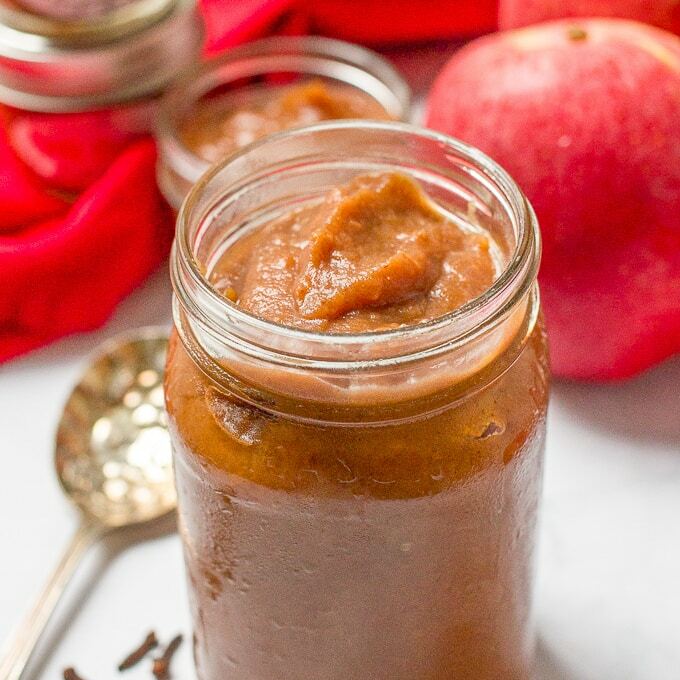 And on to today’s recipe… a slow cooker apple butter with no sugar added. It’s so easy, so perfectly sweet and so appropriate for slathering on everything this fall. I actually didn’t know until I made apple butter for the first time years ago that there’s not any butter in it. It’s just a very concentrated apple spread that’s smooth and rich and spreadable, like butter. My first batch was using some apples my parents brought back for me from the North Carolina mountains one weekend. There were all different kinds, mostly varieties I hadn’t heard of because you can’t buy them in a regular store. You want sweet apples for this since we’re not using any sugar. 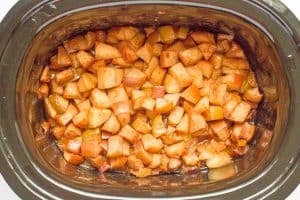 If your apples aren’t very sweet, I would consider adding 1/4 cup to 1/2 cup sugar (brown or white, or a mix) to your slow cooker to sweeten these up. I’ve used Gala apples and a combination of Gala apple and Red Delicious before. Any sweet, cooking apple will work. 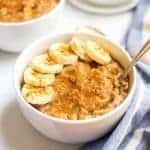 You can cook this overnight in the slow cooker, blend it in the morning and finish cooking it the last couple of hours. Be sure to check and stir the apple butter while it’s on high at the end of the cooking time so it doesn’t burn on the bottom of your slow cooker. Mine never has, but it’s a possibility. Slather it on some toast or an English muffin in the morning. It also goes great with bagels, muffins, waffles, pancakes… you get the idea. Try it on sweet potato toast for a fun fall treat. Pack some up in small glass jars and freeze for later. Or, give them away to friends, neighbors, teachers or as a hostess gift during the holidays. And stay tuned because I’ve got a great dinner recipe using this apple butter coming up for you on Wednesday. 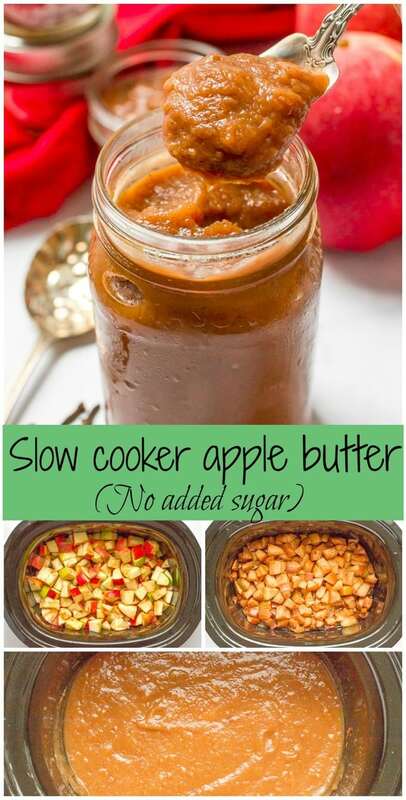 An easy slow cooker apple butter recipe with no added sugar, juice or sweeteners. 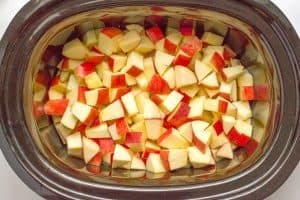 Place apples in slow cooker and add spices and water. Use an immersion blender — or transfer apple mixture to a blender - and blend until smooth. Reset slow cooker to high and continue cooking for two more hours. Leave the lid partially open to allow some moisture to escape (this helps thicken the mixture). Stir every 30-45 minutes to ensure the apple butter doesn’t burn on the bottom of the slow cooker. Let cool and store apple butter in jars in the refrigerator. I've used all Gala apples and a combination of Gala and Red Delicious apples. Apple butter can be stored, covered, in the refrigerator for up to a month. It can also be frozen for up to 6 months. I like the suggestions you added: it does sound good on toast! I’ve never actually had apple butter but man does it sound good. I’m definitely going to try some this fall! 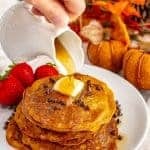 You gotta try it Vivian – it’s so smooth and delicious and perfect for fall!! 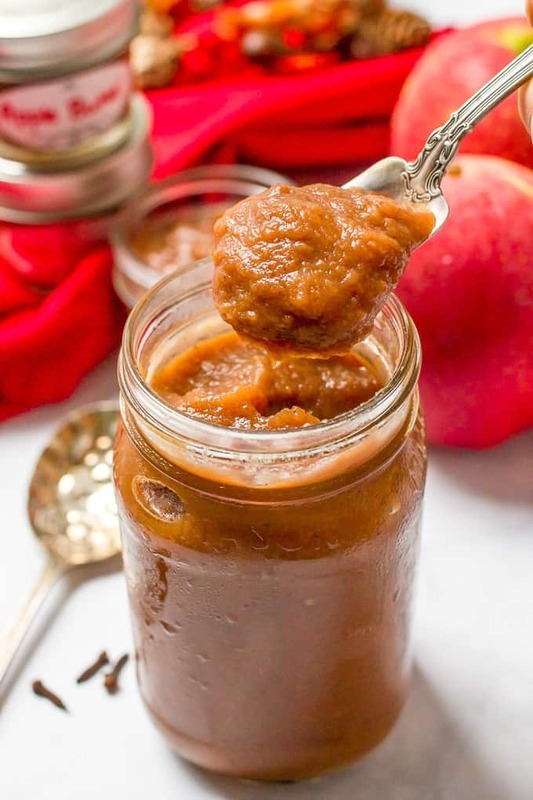 Making homemade apple butter is totally on my list this fall! I Love that you let the natural sweetness of the apples stand on it’s own!! Looks delicious! Thanks Laura! If you’ve got good apples, you really don’t need anything else! OMGeee, it’s like you are a mind reader!! I was testing apple butters yesterday, and I wasn’t happy with the one I made, so I can’t wait to try this one, Kathryn!! LOVE that it is made in t he slow cooker and without sugar! Hello easy healthy deliciousness! Pinned! Hope you have a lovely time with your father at the game!!! SO FUN! Cheers, dear! Haha, great minds 😉 Have a great week friend! I really need to try this! I buy unsweetened apple butter from a local farm but bet it tastes SO good warm out of the slow cooker too! Definitely give it a try! Homemade is always better, I think 😉 Plus you get the glorious smell as it’s cooking away! I’ve never made apple butter but your looks delicious. I love all the step but step photos! Thanks Karen! I hope you try it – it’s SO easy to make this way! 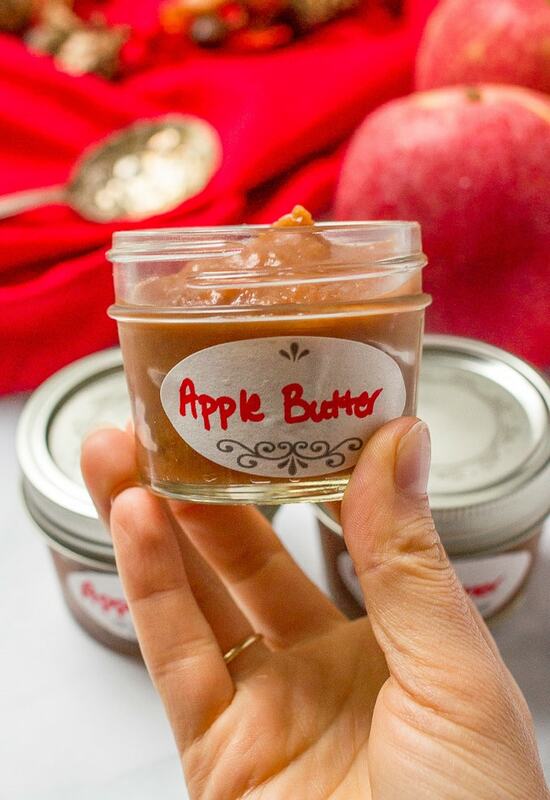 Want to reach through my screen and eat that spoon of apple butter…looks SO delish! 🙂 Beautiful photos! Sounds like a great Monday!! And this is perfect. Wow! I never realized apple butter was so easy to make! It’s like making applesauce. Pinned for later! Yes!! It’s basically a reduced-down version of applesauce (plus some spices)… definitely easy! Can this be canned to preserve? Yes Dianna! I do the cheater’s way of canning — just put it in freezer-safe containers and pop whatever I’m not using right away into the freezer for later. But I’m sure you could do the more traditional canning with this and store it away in the pantry for later. 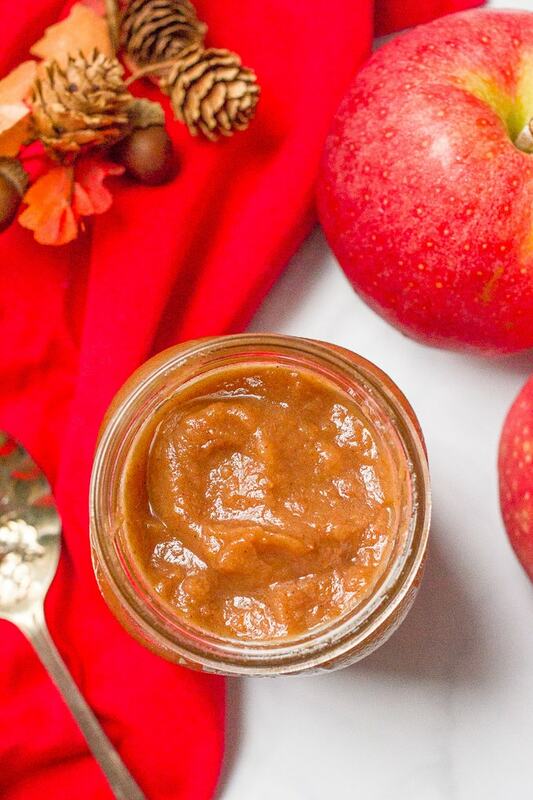 apple butter is one of our fall favorites, I cannot wait to try making it in the slow cooker. Ours too! I think you’ll love how easy it is this way!! I always prefer making different types of spices at home to finding in in supermarket. Because I think the homemade one is much more delicious, fresh and healthy than things sold. Your apple butter looks tasty and its color is perfect. Thank you so much for sharing with us. I just made this with Granny Smiths and Fujis. It’s not for the ordinary, nor for the faint of heart, but what a delightful topping for something that’s already sweet enough. I made it that way, because I figured you can add sweet to a spread, but you can’t take it out. My friends raved about it. When I asked what they sweetened it with the answer was “nothing”. They convinced me, and now i know it’s like having Apple pie with your coffee when you spread it on buttered toast. I’m so glad to hear you enjoyed them! 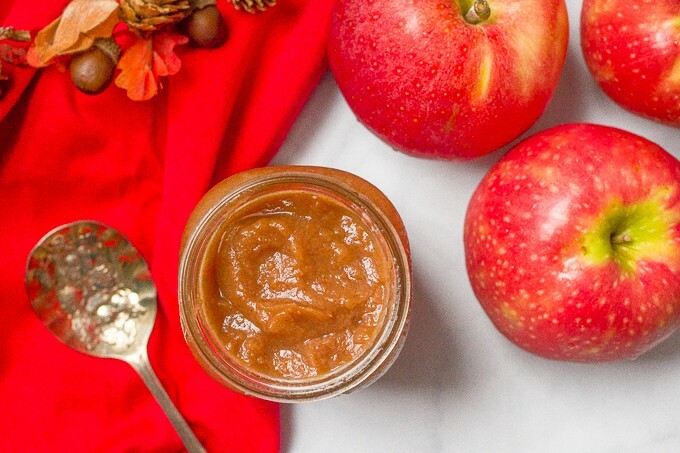 Sounds like a perfect breakfast with coffee and this apple butter on buttered toast! My husband is a Type 1 diabetic and No Sugar Added Apple Butter is one of the very few sweet things he’ll occasionally indulge in. 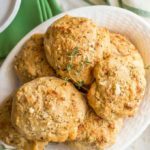 The problem is we live so far from the larger grocery stores that carry it, and it’s relatively expensive, so I was happy to have found your recipe and eagerly tried it out. I used a combo of gala and Fuji, I believe. It was super easy, though the immersion blender does take some time if you really want it smooth. The end result was DELISH, and I liked it even better than a special-recipe apple butter from the Smoky Mountains that our daughter brought home to me. My husband said it’s the best he’s ever had. I am now making my second batch and will be gifting batches to family & friends. Lovely color, texture and flavor. Thanks so much for sharing it! Oh I’m so very happy to hear that Julie – thank you so much for sharing! If I am making a no sugar added apple butter, can I water bath process it to store on shelf? Hi Holly! Yes, you can definitely follow your canning instructions and procedure and can this apple butter to store. (I’ve also skipped the canning part and stored it in the freezer.) Hope you enjoy it! 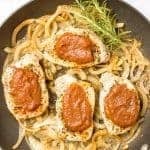 Im making this right now its in the slow cooker as i type this out.. 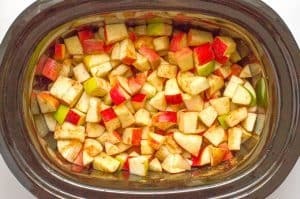 Yes, as long as your slow cooker is large enough to hold all of the apples, you should be able to double this recipe. I hope you try it! I made this with my sister during the holidays. It was WONDERFUL!!!! So happy to have such an easy recipe that eliminates all the sugar and tastes so great. We will both be adding this to our collections, and bringing apple butter back into our lives! Thanks so much! My super fussy daughter eats apple butter at preschool but I haven’t been able to find a sugar-free version in a close grocery store so I was excited to find this. I want to try it but I don’t quite have enough gala apples on hand. Do you think if I made it with mostly gala and added a few extra granny smith that it would be sweet enough? I’d really like to avoid adding more sugar. Hi Alana! I think that should be OK… it of course depends on the sweetness and tartness of the exact apples you have right now but I bet it would work. Can’t wait to hear what you (she) thinks! 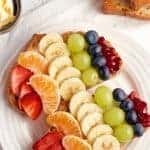 I have only been sugar free for about 6 months and still trying new recipes. 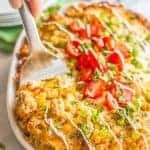 This is a winner and so yummy and easy.